Compact purifier with the filter cartridge mounted inside the main unit. 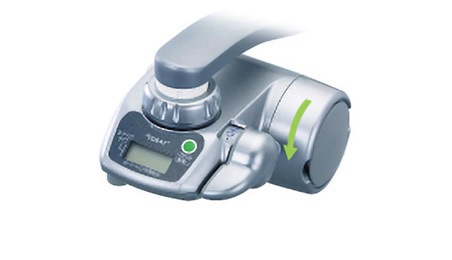 Easily adjustable water flow settings. 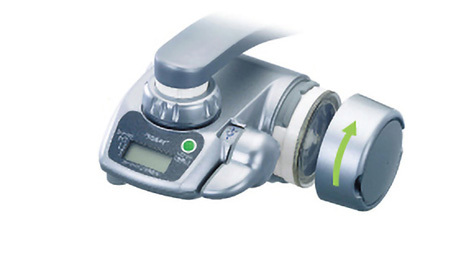 Convenient straight flow makes it easy to fill narrow-mouthed containers with purified water. Water selection lever Very smooth 3-step change! Digital display The “Digital display” shows number of liters of filtered water and indicates exactly when to reach the maximum filter cartridge life. *Not all products have this function. Show one liter unit (standard) of the avairable filtering capacity. Water saving Eco-friendly! Comfortable water volume for washing dishes! 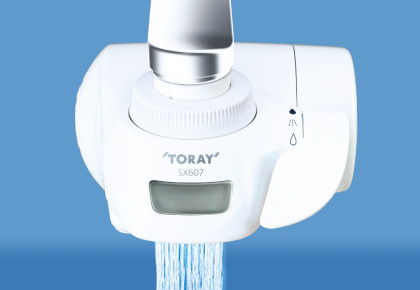 It maintains spray water pressure by having smaller holes of unfiltered shower than conventional products. *Compared with the MK203X. Measured water flow with 0.1MPa dynamic water pressure. Easy-to-use 3-step water selection lever The shape of filtered water is straight, it is convenience to pour water into narrow container. Removal of soluble chlorine and turbidity, you can use for drinking, washing fruit and vegetable and cooking. Up to 50℃ can be used, which allows you to wash dishes comfortably. 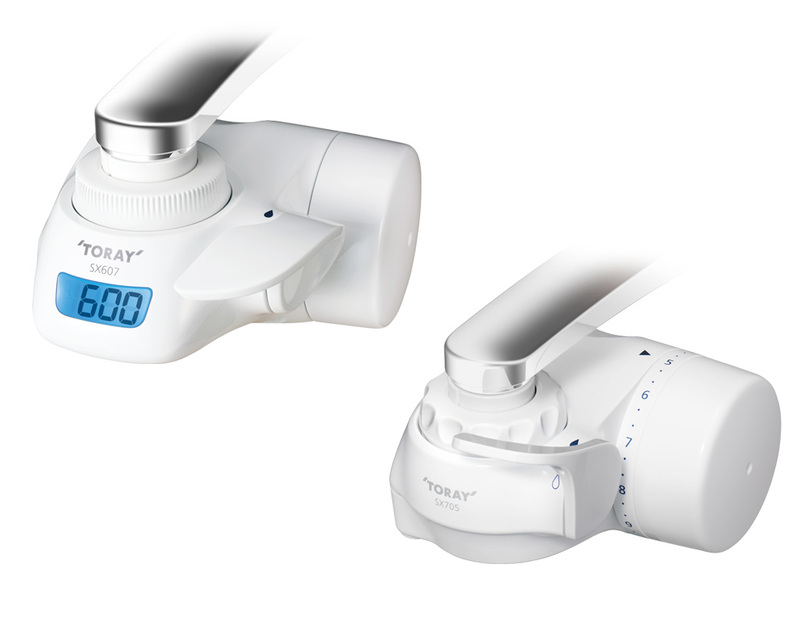 Easy to check trapped impurities through "See-through Window" This unique feature incorporated only in TORAYVINO™ ! Simply open the filter cartridge cap and check contaminant build ups through "See-through Window"to actually see whether the filter cartridge needs replacing. The filter water is therefore always safe and tasty. Easy installation and replacement of the filter cartridge Filter cartridge attachment / replacement is as easy as 1-2-3! Remove the filter cartridge cap by turning it in the direction of the arrow. 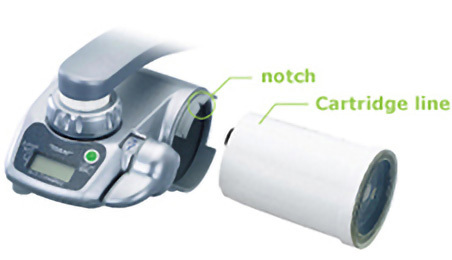 Push it in so that the line on the filter cartridge is at the V-shaped notch on the valve body. Turn the filter cartridge cap in the direction of the arrow until it stops. 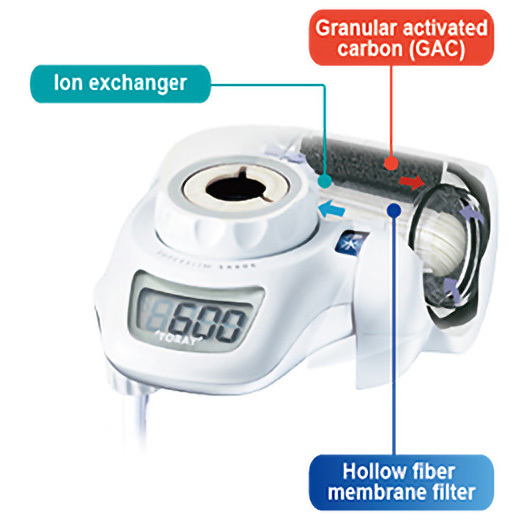 *Water quality and regional / usage conditions may shorten the life of the filter cartridge. Brings delicious water that still retains the calcium, magnesium, and other important minerals essential to your body. 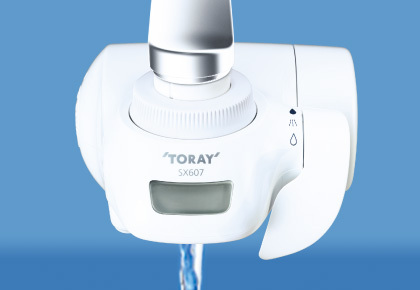 Toray's advanced multilayer hollow fiber membrane filters remove rust, bacteria, coliform bacilli, microorganisms and microscopic impurities from water and other liquid solutions without removing calcium, magnesium and other minerals essential to the human body. In the field of medicine, these filters enjoy widespread use to purify blood in artificial kidneys. 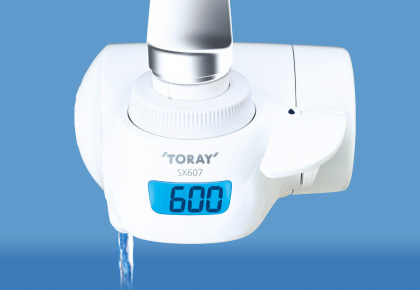 *Experimental results shows that the unit removes 99.99% of bacteria, meeting the Japan Water Puridier Association (JWPA) Volantary Standards "B.200 Standarad for Removal Performance of Water Purifiers (Bacteria Removal Performance Test)"